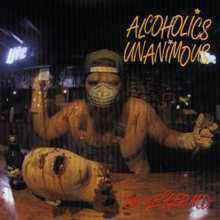 Alcoholics Unanimous ‎– Dr. Kegger M.D. Issued with 12'' b&w insert printed on both sides (lyrics, pictures, credits). Dedicated to the great Sonny Burgess and to the memory of Charles Bukowski. Matrix / Runout (Side B, etched): TEAR-009 B BOOZE IS THE ANSWER!